A few months ago, I was looking up different Korean restaurants around Metro Vancouver to eat at. 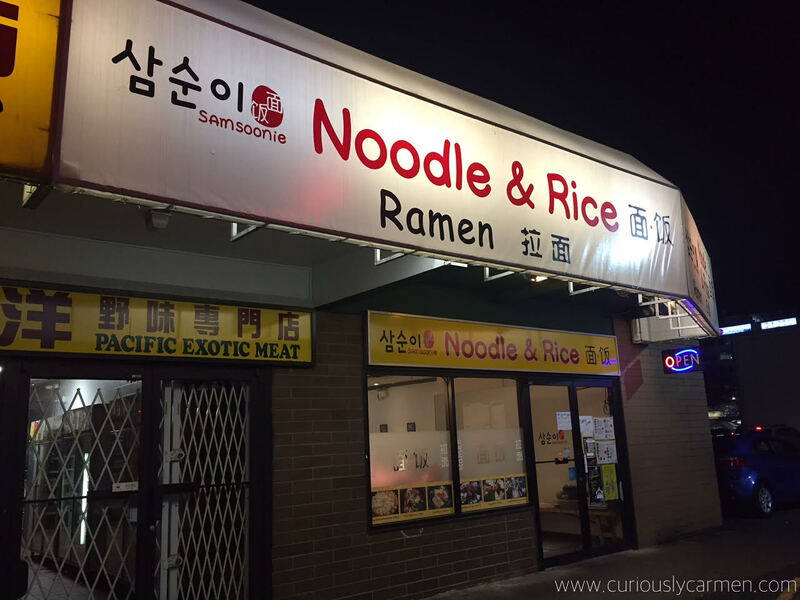 I came across Samsoonie Noodle & Rice in Richmond, and it had pretty good reviews so the boyfriend and I went to try it one weekday evening! I would say that Samsoonie is pretty hard to find if you’re not looking for it. 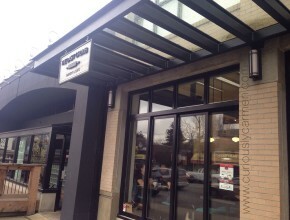 It’s tucked away in a plaza, the last store hidden in the corner. We ended up driving past the whole plaza and found it when we drove around it for a second time. It wasn’t too busy when we went there. Seating was comfortable and spacious. Considering that there was only one server working that night, service wasn’t too slow. 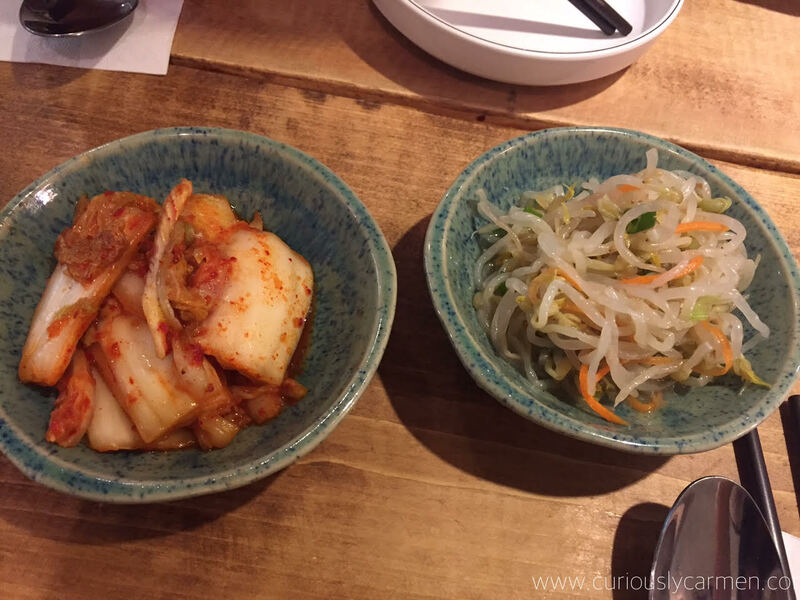 Banchan, free: Samsoonie only gave us two appetizer dishes, which is fine because we normally don’t finish everything anyways. Normally, places give four places but I’ve been to Korean restaurants that give up to 6! 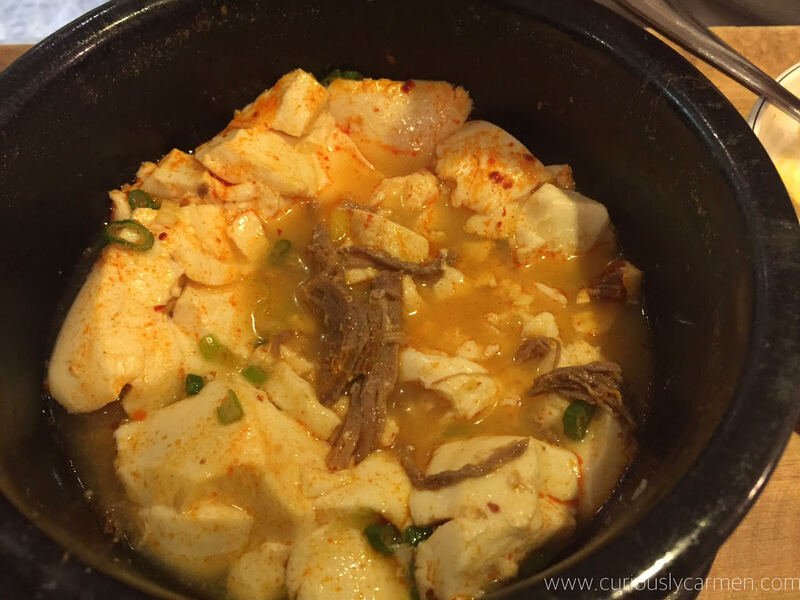 Soft tofu hot pot, $8.99: My go to dish at Korean restaurants is the sundunbu, or tofu hot pot with choice of meat. 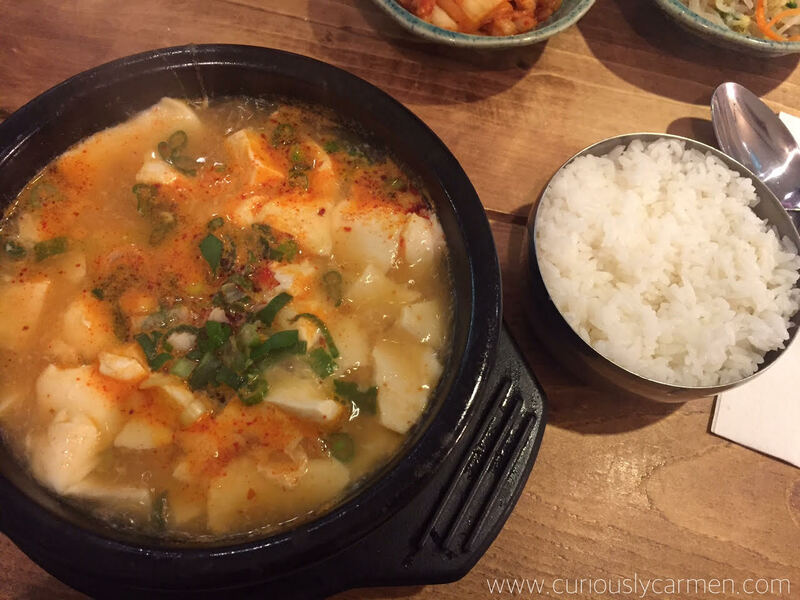 This hot pot came with an average amount of seafood but a lot of soft tofu! I was so stuffed at the end of this meal, I didn’t even finish the rice! I found that the soup was slightly bland compared to other places. It wasn’t too flavourful or spicy and didn’t have much depth. It wasn’t entirely terrible though, and I still felt satisfied after eating it. Beef soft tofu hot pot, $8.99: I didn’t take a picture when it arrived because it looked the same as mine. Again, the soup broth wasn’t super flavourful but the boyfriend still enjoyed it. There wasn’t much beef to the pot, but the beef itself was really soft and flavourful. It was the boyfriend’s favourite part of the dish, even if there wasn’t a large amount of it. 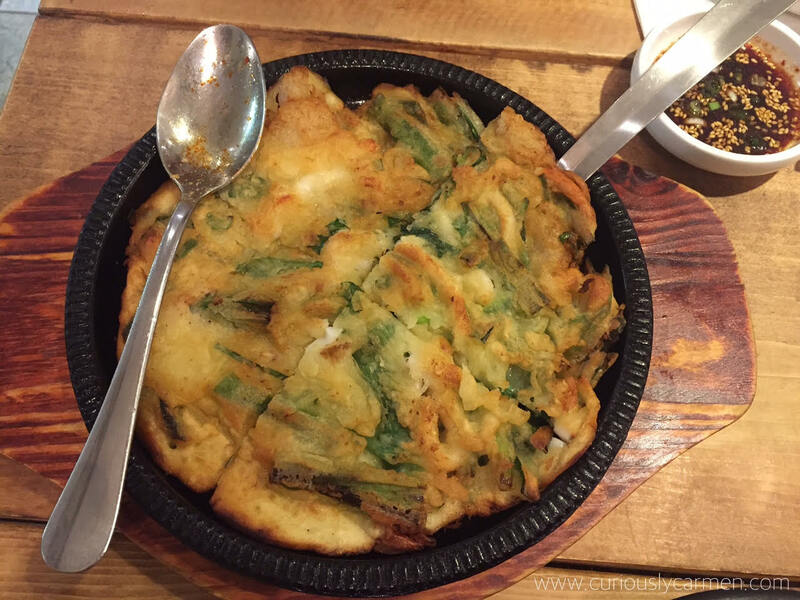 Seafood pancake, small, $9.55: The boyfriend wanted the large pancake but I knew that we would not be able to finish it. It would have just been a repeat of House of Tofu Soup, so I suggested we order the small. The seafood pancake was delicious! 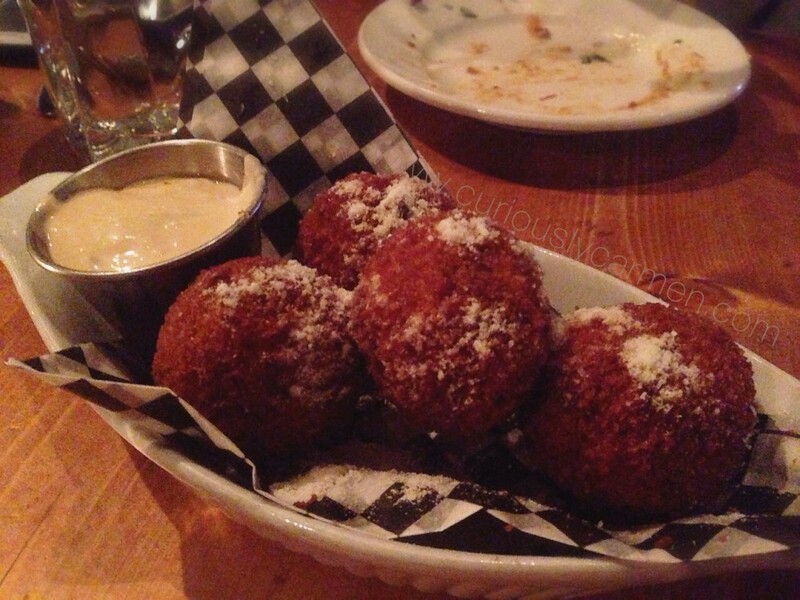 It was nice and crispy on the outside, but soft on the inside. There was an average amount of seafood inside, but it was stuffed with leeks. The spoon is there for comparison. It was the perfect size for us, the large would have been too much and we would have had to end up packing it up. 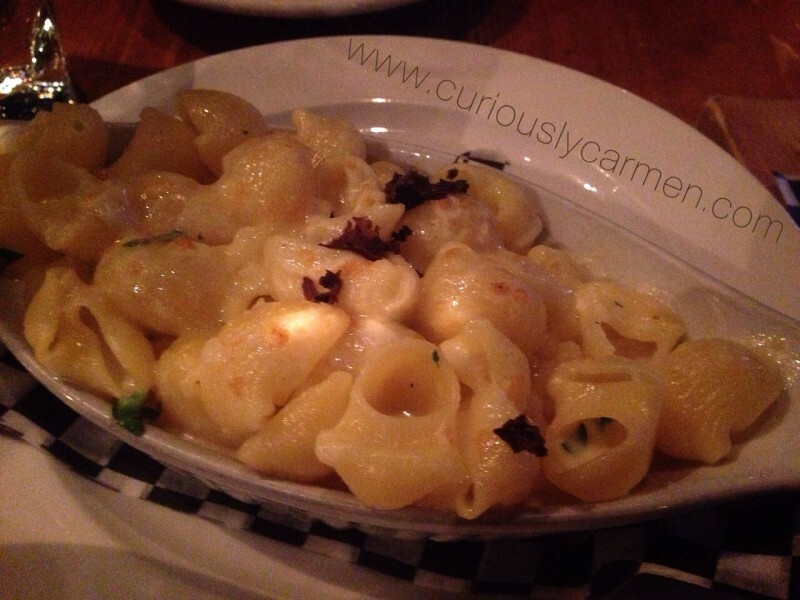 Overall, Samsoonie is a pretty decent restaurant but not one that I would crave again. I wish that the broth would have been more flavourful and less watery, but service was really friendly and seating was comfortable. There are so many Korean options to choose from in Vancouver, so the food has to be super delicious to be able to compete with each other. I would prefer to go to Jong Ga or House of Tofu Soup, both in Korea Town. However, we had slight management issues which I will explain down below. This location offers a semi-private room that seats 30 guests. 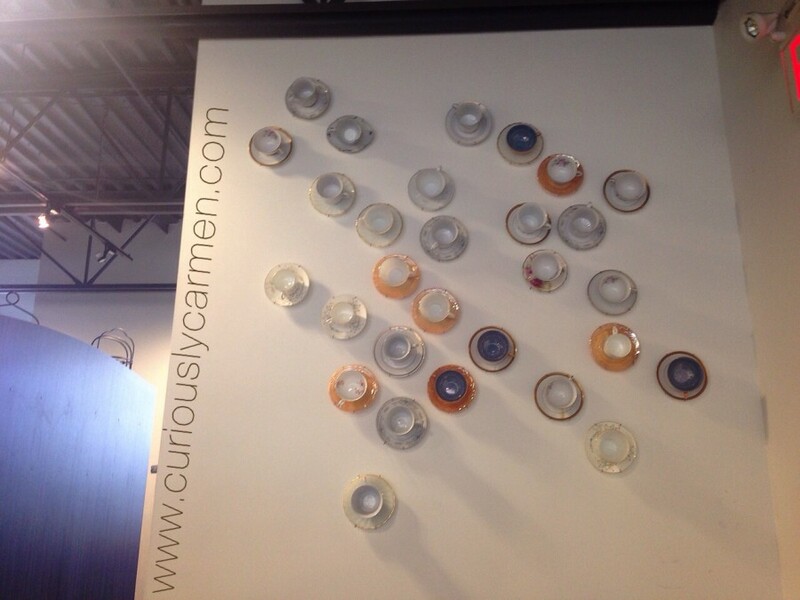 It is in the back of the restaurant, right before the kitchen and washrooms and is closed off on all three walls, except for one wall which is completely glass where you enter from the sides. Even though it is covered off, you do not feel completely isolated but it’s nice when there is a large party, and you guys want some privacy. 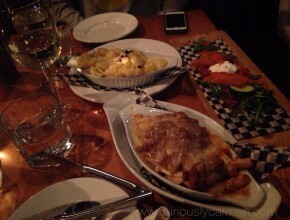 There were many plates of food, beer, and wine that were ordered, but I decided to only focus on the food that I actually tried that night! 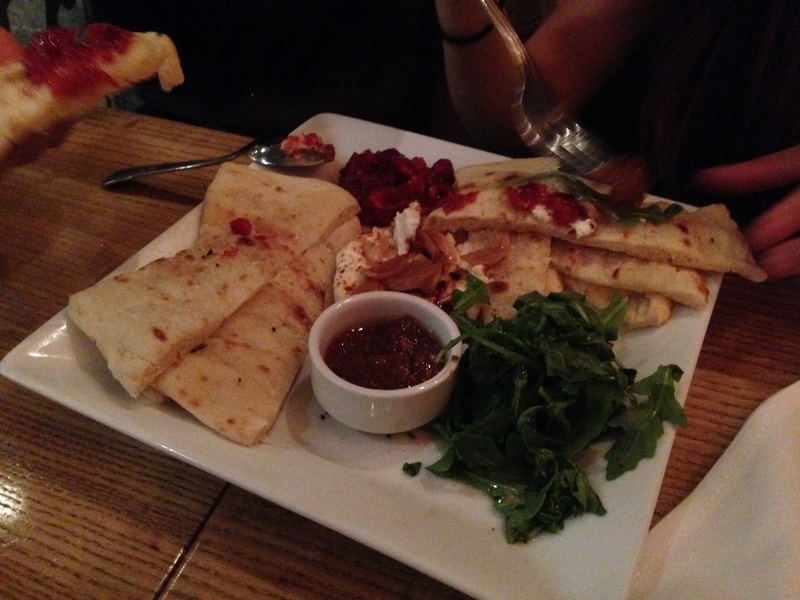 For starters, my two friends got the baked goat cheese and slow roasted garlic flat bread. It came with cranberry relish and fig jam as well. 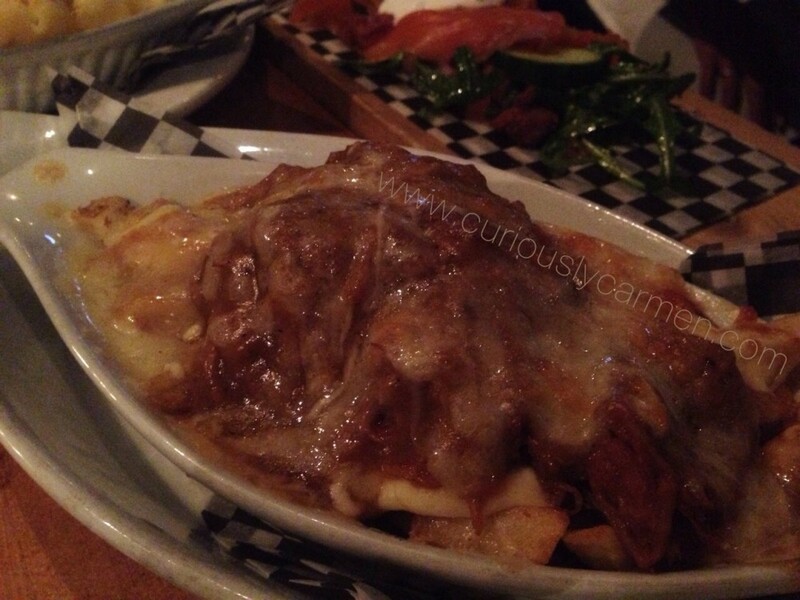 All of the flavours of this dish complemented each other tremendously well. The bread was extremely soft and warm as well. Definitely a great starter dish! 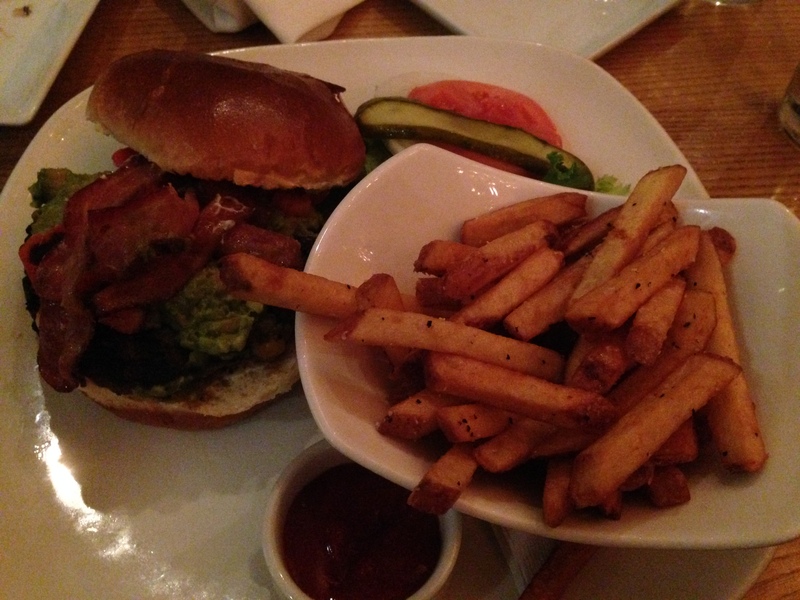 For myself, I ordered the California burger which came with avocado, salsa, and bacon. 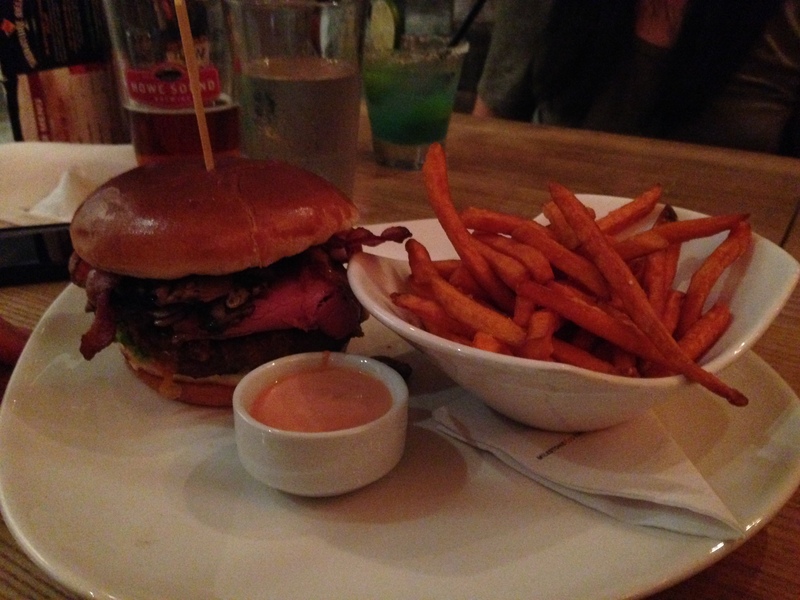 I fell in love with this burger the last time I got it, and this time was no different either. I loved the inclusion of the avocado, and felt that all the flavours worked really well together much like the flat bread dish. The fries were pretty standard and came with freshly ground pepper as well. The boyfriend ordered the stacked burger. 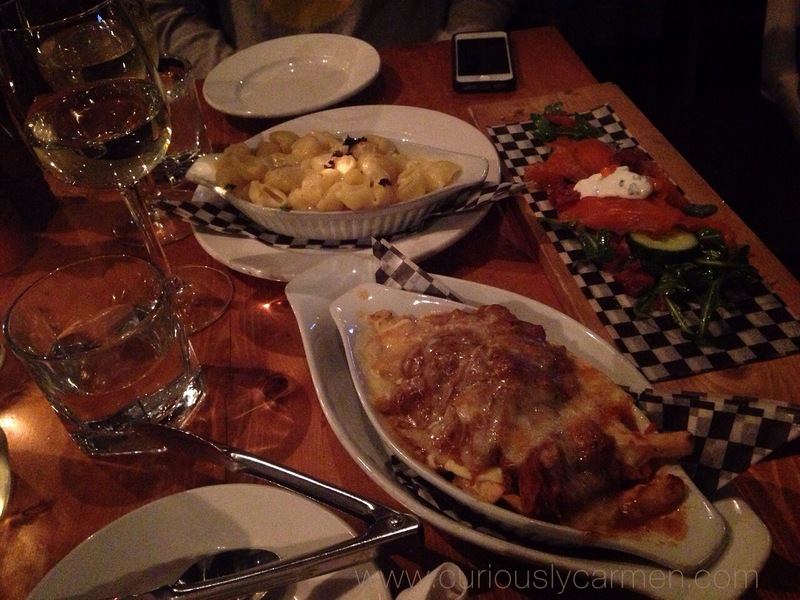 Prime rib, Montreal smoked meat, bacon strips, cheddar cheese, plus more goodies. 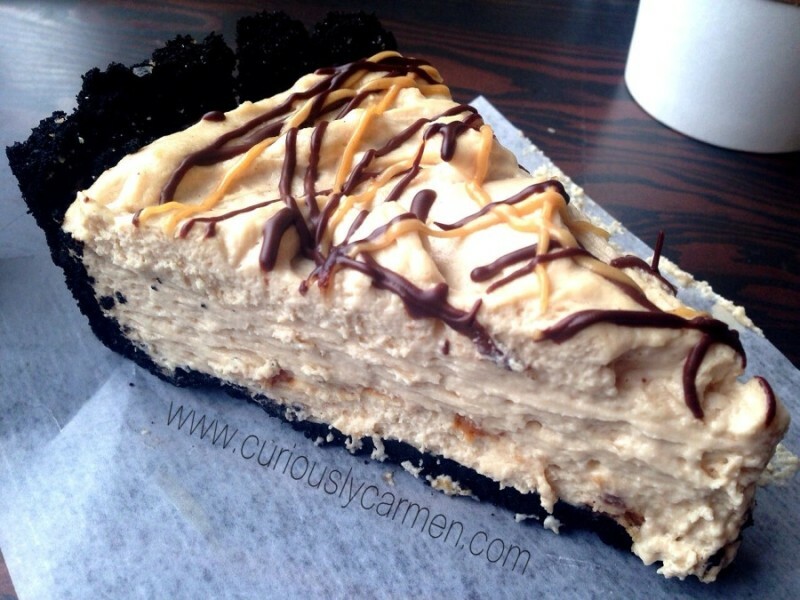 This is the epitome of an indulgent and guilty meal, but it was oh-so-delicious. 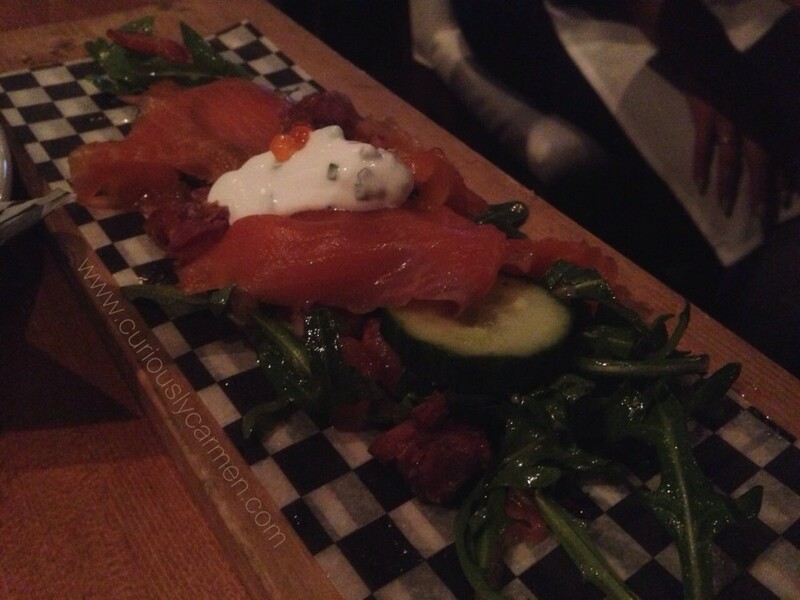 The Montreal smoked meat was very tender and juicy, along with the mushrooms. Burgers like these are to die for, but important to have them in extreme moderation because they are definitely not calorie or fat friendly! 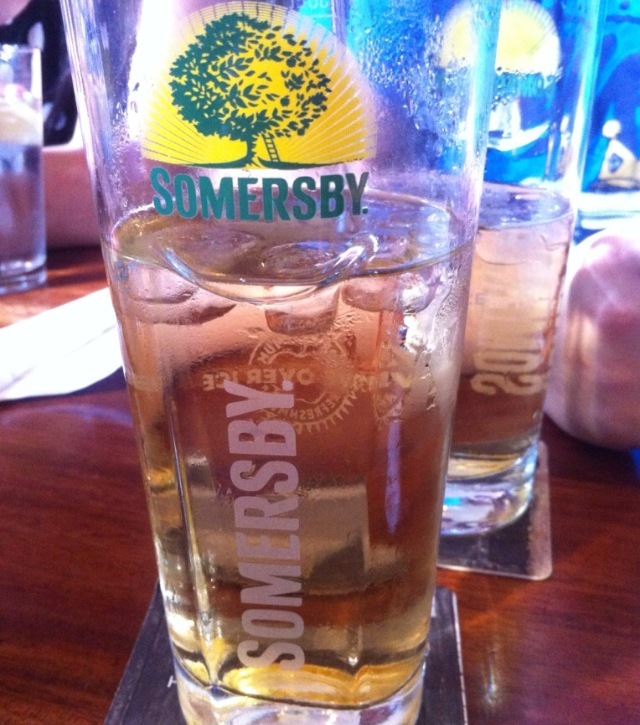 For drinks, I ordered the Sombersby cider which I got the day before at Elephant and Castle. I just took this picture from that previous post as I forgot to take a picture of it at Milestones. 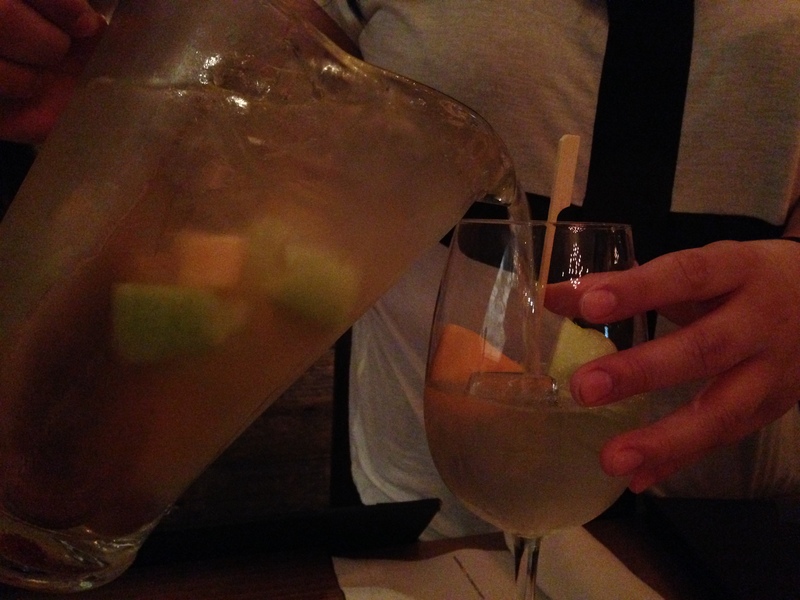 My friends decided to share a pitcher of sangria. 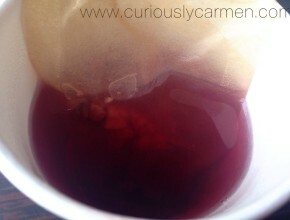 It was made with Sombersby white wine (same company as my cider), and was absolutely delicious as well! There were many fruits in it, making it super refreshing. Now for the management issue: We had buy one get one half price entree coupons, which I think the management was upset at, so they told us that we needed a minimum $600 charge for the semi-private room. We suspect that they had just added that policy that night due to the coupons. My friend has had his birthday here for the past six years and they have never mentioned that “policy” before. We thought it was a bit rude and unprofessional for the restaurant manager to suddenly barge in during our dinner, and ask to talk to the birthday boy. Other measures could have been taken that were less invasive and awkward. There was no fine print on the coupons nor restrictions, so we weren’t breaking rules nor was it our fault; they should have specified the limit of one per table or something like that if they were going to be upset about it. We also ordered alcohol and appetizers, so it wasn’t like we were there just to solely use the coupons. 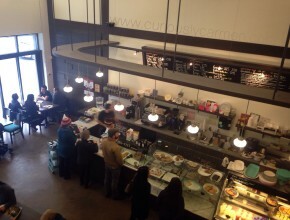 Apart from the management, our servers were very friendly and attentive.